From Tevye in “Fiddler on the Roof” to Benedick in “Much Ado About Nothing,” Collin Vorbeck, C’02, always dreamed of being a famous actor one day. While at the University of Saint Mary, he majored in theatre and starred in 16 shows—not missing a single production during his four years. Collin professionally acted for a few years after graduation, but then decided to enter busy corporate America. Though he was completely away from the stage for 10 years (with very little time to do anything but work), Collin constantly thought about his days in the theatre. Recently, he decided to end his sabbatical from the stage. This spring, Collin came back home to Saint Mary to guest direct USM’s production of “The Glass Menagerie.” He also started his Master of Arts in Theatre History at the University of Missouri-Kansas City and got back to doing what he loves—acting. To his surprise, Collin landed a role this summer in “King Lear” at the Heart of America Shakespeare Festival in Kansas City, and he couldn’t be happier. Collin’s dreams have changed from “being famous” to being a professor by day, director by night, with summers spent at the Shakespeare Festival. No matter where this new dream life takes him, he will always remember Saint Mary. Success stories to tales of lives well lived to memorable trivia—we’re always looking for a new Saint Mary alum to spotlight. 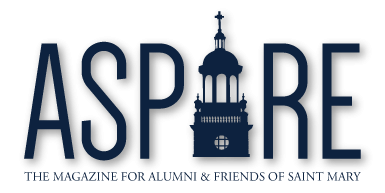 Send your stories or memories to alumni@stmary.edu with “A Saint Mary Story” as the subject line.